There was no other steam program in the diesel era as ambitious as the program run by the Southern Railway (and later successor Norfolk Southern) starting in the 1960s and running until 1994. 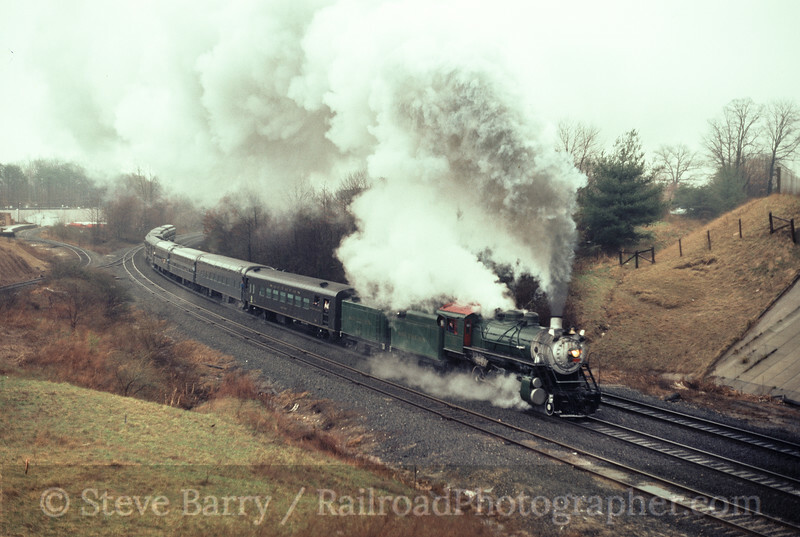 A modest program expanded to the point where there were two main line steam powered trips running almost every weekend except in the winter. Over the years I had the chance to see many of the locomotives used by the Southern and NS. 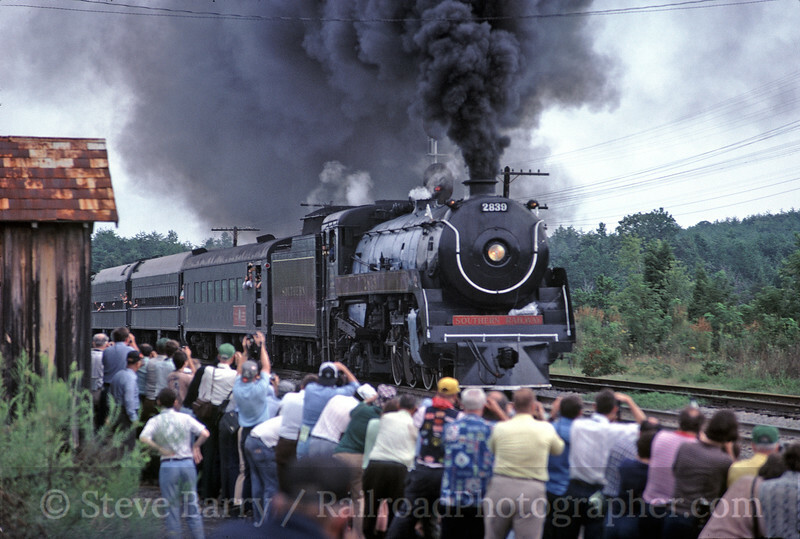 My first encounter with the Southern Steam Program was in August 1978 when I convinced Dad to chase a trip from Alexandria to Charlottesville in Virginia. Power for the trip was leased Texas & Pacific 2-10-4 No. 610 (above), a massive locomotive. 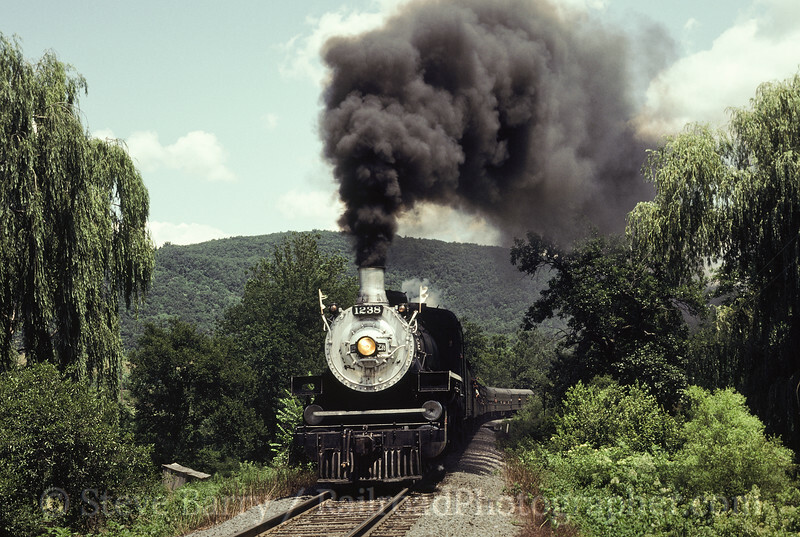 This would be the only day I would see 610 under steam. My first National Railway Historical Society convention was the gathering in Washington, D.C., over Labor Day weekend in 1979. The Southern lacked a fast main line locomotive in its roster, so it turned to a leased engine, Canadian Pacific "Royal Hudson" No. 2839. With its tall drivers and impressive speed, Southern's Master Mechanic-Steam William Purdie commented, "Now I have a locomotive that can outrun the railfans." Now that I knew about the Southern program, trips to Alexandria to chase steam became common. In March 1980 I followed Southern 2-8-0 No. 722 as it ran over the Front Royal branch. The 722 was one of the original locomotives in the steam program and its light weight, low drivers and strong pulling power made it the perfect locomotive to pull low-speed trips on the branch lines. In 1981 Southern found itself power-short. The 722 was down and couldn't work the Front Royal branch, so the Southern turned to a privately-owned locomotive -- Jack Showalter's ex-Canadian Pacific 4-6-2 No. 1238 (lettered for Showalter's Allegheny Central). 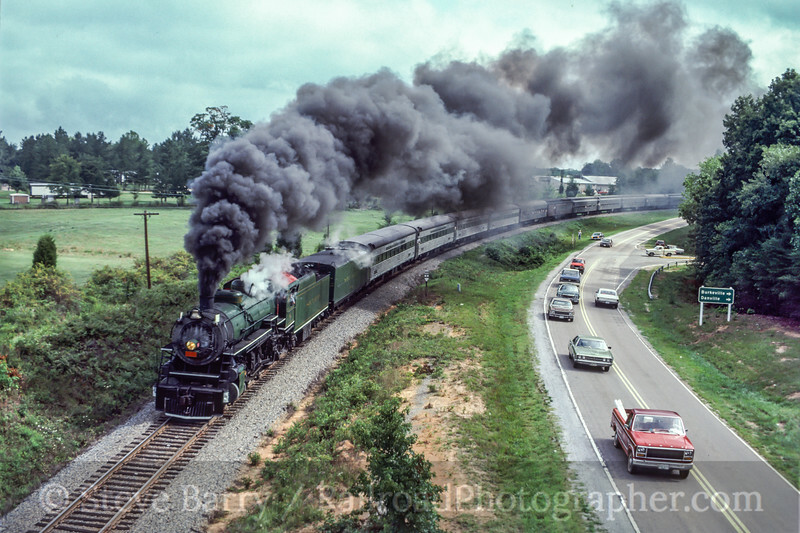 The Southern advertised a photographer's special that year, promising numerous runbys. I tried to get tickets, but the trip sold out so I decided to chase. Somehow the locomotive ran low on coal, so after about two photo stops the rest of the runbys were canceled. The chasers were the winners that day! Canadian Pacific 2839 was soon returned to its owner and the Southern started looking for another high-speed main line locomotive. This time they turned to the Kentucky Railway Museum and discovered ex-Chesapeake & Ohio 2-8-4 No. 2716. Unlike the Royal Hudson, which Southern ran in its Canadian Pacific colors, the 2716 was taken into the Birmingham shops and had its distinctive C&O look changed to a Southern look by Mr. Purdie. 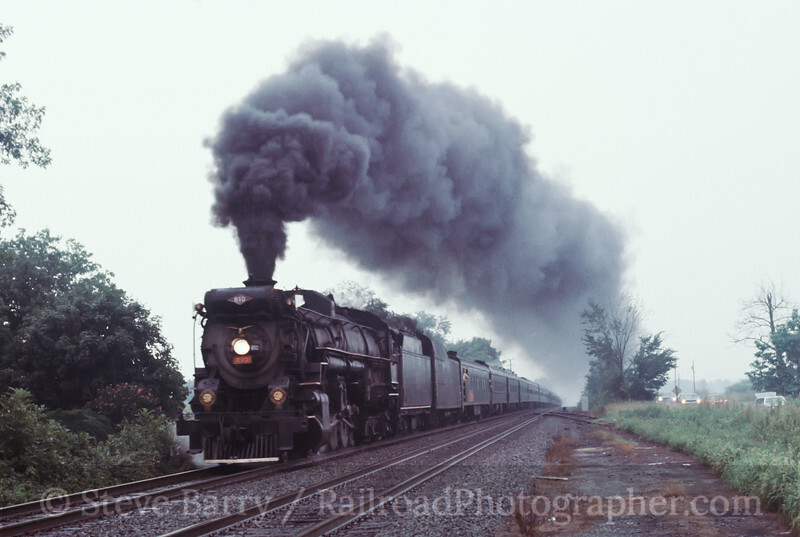 I chased one trip with 2716 to Charlottesville, but in 1982 firebox problems sidelined the locomotive for good after a too-brief career. I had the chance many years later to ask Mr. Purdie what his favorite locomotive was in the program and he quickly said, "The 2716." The star of the Southern Steam Program was always 2-8-2 No. 4501. Painted in its apple green, it was the flagship locomotive of the program. Somehow, though, I could never catch up with 4501. A trip to Shenandoah, Virginia, to chase it resulted in chasing diesels substituting for it. Finally, in 1985 I made it to Richmond to chase a trip to Keysville, Virginia. Finally, I had crossed paths with the 4501. It would be the only time I would see her under steam. In 1982 the Southern Railway merged with the Norfolk & Western to create Norfolk Southern. With the N&W a part of the railroad's legacy, a pair of N&W steam locomotives was added to the mix. Class J 4-8-4 No. 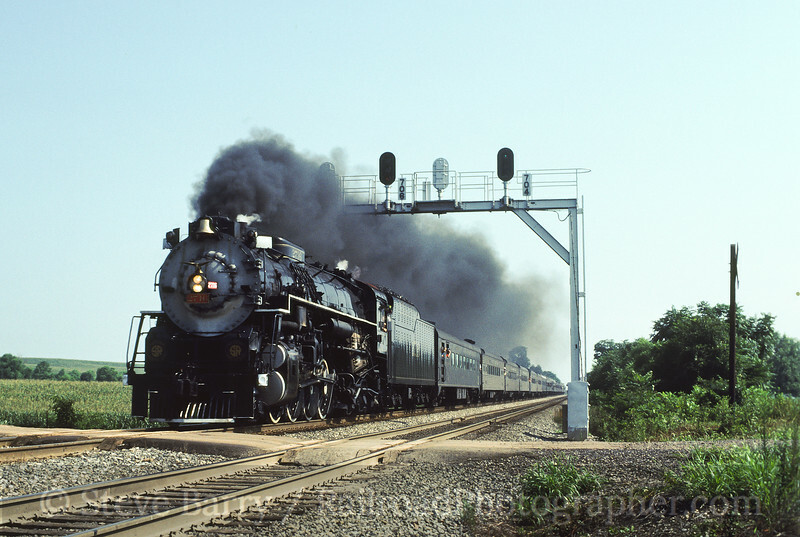 611 was first, and one of the most memorable chases I had with her was in September 1989 on a trip from Roanoke to Walton up Christiansburg Hill. 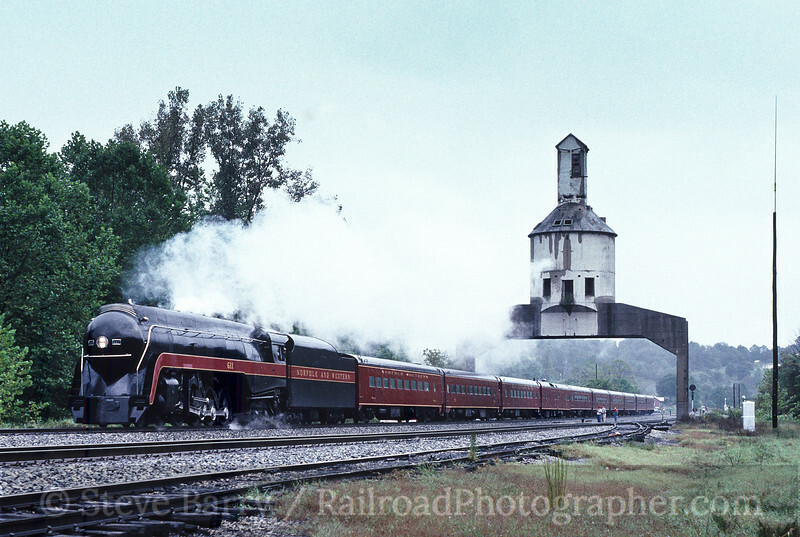 The trip was billed as a recreation of the N&W passenger train Powhattan Arrow and the 611 pulled an all-tuscan red consist -- plus, it carried no water canteen behind the locomotive tender, one of the rare times this happened. One of my favorite shots from that day was of the 611 passing under the coaling tower at Vicker, Virginia. The Norfolk Southern Steam Program came to an end in 1994. There are plenty more stories and plenty more photos from those trips, and we'll relate a few of those in the coming months.